While betraying a certain setting fisherman, Sagene 33 Open is a multipurpose boat designed with interior solutions typically cross-ristics and with a step that, already pleasantly cheerful with standard engines, tends to become sportsman and gritty by installing the max power 2x300 HP. 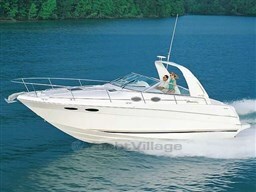 Lean and racy line, despite the importance of the freeboard (especially at the forward), is divided into a classic and functional module Interior. The size of the volume was nevertheless well exploited to create spacious and bright, almost everybody in al ¬ tezza. Accurate finishing and material selection of furniture including it should be noted, although normally covered with carpet, mahogany plywood floor. Interesting and original to the indivi ¬ ni adopted in cockpit with foldaway kitchenette under the seat Guide (optional), the L-shaped sofa without backrest in pop soul-piero to facilitate any ope-rations of fishing, and the entire block front of cockpit that sol-total access to engine room electrohydraulically at the lever. Built with special atten-tion to the structural robustness of ¬ King, Sagene 33 remembers its aft cockpit area fisherman especially ancestry: a large area of low and totally open manoeuvre, characterized by generous walled gunwale, and a very effective non-slip. Bearing in mind that the boat we used for testing was still a prototype, it should be noted that in navigating the Sagene 33 offers an immediate sense of control and speed performance. Obedient to every command when manoeuvring, quick to get planing, security in step waveform decided although shows sometimes the generosity of the beam can be affected by the impact. 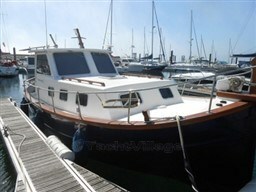 Dear Sirs, I have seen on YachtVillage your offer about Sagemar 33 Open - 1990 (code: 387317). I am interested in the offer and would like you to contact me. Thank you.